In front of most front windows on vehicles are what's called a hood in the United States and much of English-speaking North America, or a bonnet in English-speaking Europe. Most hoods lift up in the front, but some open up backwards or (in the case of many racing cars) are only held on with pins. Sometimes hoods have intake scoops which can either be just for aesthetic purposes, additional engine bay cooling, or extra performance by means of ram air. In vehicles with an engine in the front, the engine will be under the hood, but if the engine is behind the driver, it will be found under the trunk/boot, and the hood will either be fixed to the vehicle or conceal a storage compartment. Hoods are a common piece of the body to replace with a more lightweight version because they are easy to remove and any style changes on them are easy to spot. Carbon fiber is a common material for making lighter hoods, such as the one pictured at the right, but fiberglass is also used. 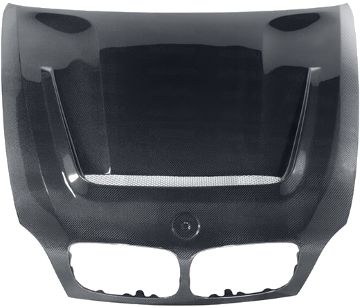 Carbon fiber has a uniform pattern to it, leading some to leave the hood unpainted as a style choice.